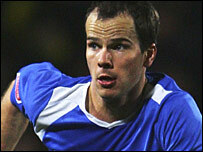 Leicester have signed midfielder Stephen Clemence from Birmingham for a fee which could rise to £1m. The 29-year-old has signed a three-year deal and becomes Leicester's 11th signing of a productive summer under new manager Martin Allen. Allen said: "He is a good experienced player who is ambitious to do well. "He was the captain and player of the year at Birmingham in a side which won promotion and I'm sure he will be a big asset to the squad." Clemence told his new club's official website: "I am 29 and I want to play football, and if I'm playing well, then I firmly believe that I will play every week here. "I don't want to be sitting in the stands and sitting on the bench - that's just not me. "I want to play football and want to try and achieve something here with Leicester City."